Home » News Hub Articles » Drones Under the Christmas Tree? If you are thinking about buying a drone/UAV for yourself or a family member this Christmas, we would like to remind you once again to make sure you also get fully acquainted with the rules around flying drones outdoors in New Zealand. Perhaps you are planning to start with a mini-drone that can be flown indoors - in that case, go for it, there are no restrictions apart from keeping an eye out for the basic safety requirements inside any home! If you are going to invest in a drone that flies outdoors, then you need to do a little more homework before you start flying. 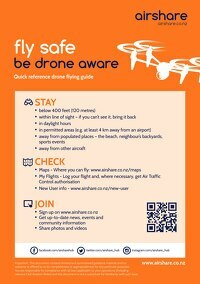 airshare is designed to provide all the information you might need about the rules for flying drones in New Zealand, as well as a place to register yourself as a recreational (or commercial) drone pilot, check maps for areas around NZ that are safe to fly, and to log your flights. If you log your flights with us, then you can always refer back to previous flights and resubmit them if you are planning the same flight again. You'll also find information here about travelling safely with your drone (and its batteries!) and other helpful tips to get your skills up. You can download or share with friends the flyer we have put together for new drone owners, and also share our Drone Safety video.